Swann Morton No 18 Non Sterile Blades, Individually VPI protected in Metal Foil Packs of 5 Blades. Available in Grip-Seal a bag of 50 Blades or Boxes of 100 Blades ( note the grip-seal bags of 50 are packed by Scalpels and Blades ). 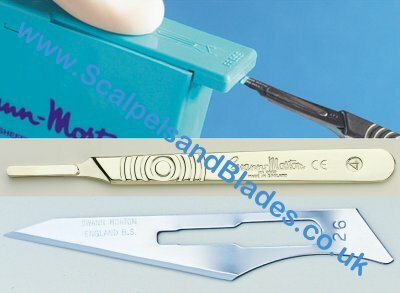 Swann Morton Sabre B/23 Non Sterile Blades, Individually VPI protected in Metal Foil Packs of 5 Blades. Available in Grip-Seal a bag of 50 Blades or Boxes of 100 Blades ( note the grip-seal bags of 50 are packed by Scalpels and Blades ). 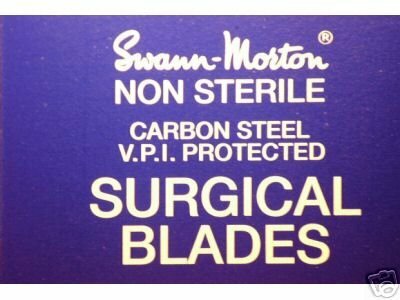 Swann Morton No 24 Non Sterile Blades, Individually VPI protected in Metal Foil Packs of 5 Blades. Available in Grip-Seal a bag of 50 Blades or Boxes of 100 Blades ( note the grip-seal bags of 10, 25 or 50 are packed by Scalpels and Blades ). Also available in boxes of 100 Blades packed in single foil packs ref 3011. Swann Morton No 25 Non Sterile Blades, Individually VPI protected in Metal Foil Packs of 5 Blades. Available in Grip-Seal a bag of 10, 25 or 50 Blades or Boxes of 100 Blades ( note the grip-seal bags of 10, 25 or 50 are packed by Scalpels and Blades ). Swann Morton No 25 Sterile Stainless Steel Surgical Blades. Box of 100 Blades single peel in metal foil VPI protected. Swann Morton No 26 Sterile Stainless Steel Surgical Blades. Box of 100 Blades single peel in metal foil VPI protected. 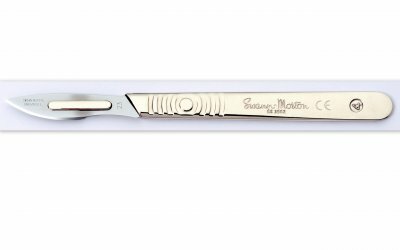 Swann Morton No 18 Sterile Stainless Steel Surgical Blades. Box of 100 Blades single peel in metal foil VPI protected. Swann Morton No 22 Sterile Stainless Steel Surgical Blades. Box of 100 Blades single peel in metal foil VPI protected. Swann Morton No 23 Sterile Stainless Steel Surgical Blades. Box of 100 Blades single peel in metal foil VPI protected. Swann Morton No 21 Sterile Stainless Steel Surgical Blades. Box of 100 Blades single peel in metal foil VPI protected. Swann Morton No 19 Carbon Steel Blades, Packed in grip seal bag of 10 Blades. A further extension to the Histopathology and Autopsy range the No.22B carbon steel blade has the added safety feature of a "bull nose tip" to help offset the occurrence of accidental sharps related injuries during use. It is available individually wrapped in foil and boxed in units of 100 pieces and can be used in conjunction with a standard No.4 Stainless Steel surgical handle.